Plato said, “At the touch of love, everyone becomes a poet.” And if I may add.. and if given paper, scissors and glue, a cardmaker too! Here is a card perfect to make for that special someone in your life! Make a heart pattern using cardboard or used plastic folder. Use the pattern to cut matching hearts out of the backing material and decorative material. Stick decorative paper onto foam hearts using adhesive of your choice. Use dimensional paint to draw diagonal lines to wrap edges of the foam heart (this is to mimic white stitches which I did the first time I made this card). [Optional] Stick a colored paper insert on one side of the card using paper that matches the color of the heart. So do… as James Taylor says, “Shower the people you love with love. Show them the way that you feel.” A handmade card says and means a lot! Hi Paulina ! Great blog – glad to see you on here and thanks for sharing your ideas! 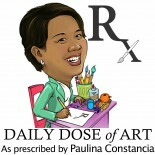 This entry was posted on January 27, 2012 by Paulina Constancia in Communicate, Create, Teach and tagged Arts & Crafts.